Bicycle is the best way to travel from Saigon to Hanoi, if you have the right guide to show you the hidden back roads. Known to many as simply the site of the French and American wars, this is actually a beautiful country, with many kilometers of stunning beaches, dramatic coastal roads and spectacular scenery stretching from the North to the South. This trips is never far from a beach and we stay in comfortable hotels to make this one of our most cushy adventure tours. 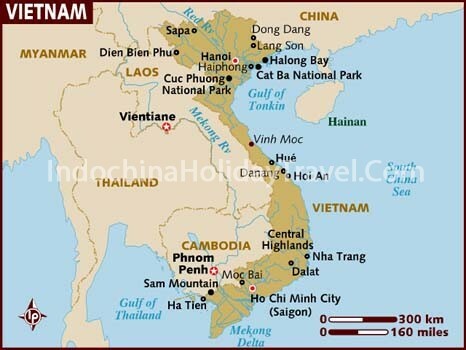 Join Indochina Holiday Travel to discover the real Vietnam, by bicycle! Enjoy 2 hours driving to Dong Nai province. Ride through coffee plantation, pepper on hilly country roads in surounding area of Nam Cat Tien park. Have in Madagui and have another stop at Bao Loc, the homeland of coffee and green tea. Enjoy delicious speciality snack, coffee and tea. Then have a transfer to Dalat. Transfer 30 minutes of out busy city of Qui Nhon. Begin with cycling through rice-paddy to mountain areas. Cycle past many little villages to ocean roads. Today you will have the opportunity to admire beautiful coastal roads. In the afternoon, cycle uphill through mountains, rice fields, and coconut plantations. Transfer by bus/van in the late afternoon to Quang Ngai. Ride to visit the forbidden city, the capital of Vietnam from the 17th to 20th centuries, continue riding on single track trails to the Royal Tombs of the Nguyen Dynasty. Visit the Tu Duc tomb and Khai Dinh tomb before having lunch. Fly to Hanoi in the afternoon. Have breakfast at hotel, relax on your own free time until driving to the airport to flying home. End of services!